Students can choose from 48 majors in the natural sciences, humanities, social sciences and fine arts. The student-to-faculty ratio is 8:1 with an average class size of 15 students. Students can cross-register for classes at the other Claremont Colleges, with some 2,700 class options. Students interested in engineering can participate in 3-2 programs with Caltech and Washington University in St. Louis, or the 2-1-1 program with the Thayer School of Engingeering at Dartmouth, and earn a B.A. and B.S. in engineering in 5 years. Learn more. 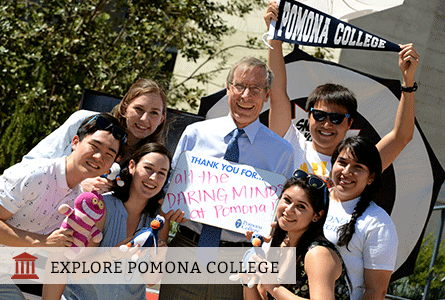 Pomona offers semester exchange programs with Colby College, Smith College, Spelman College, Swarthmore College and California Institute of Technology, as well as a Semester in Environmental Science program at the Marine Biological Laboratory in Woods Hole, ME and, through Claremont McKenna College, special semester programs in Washington, DC and Silicon Valley. Pre-professional advising is available for students interested in pre-law, pre-medicine, pre-business or pre-teaching. About half of our students study abroad, choosing among 61 programs in 35 countries.